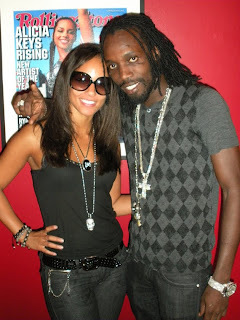 After another stellar performance at the HOT97 On Da Reggae Tip show on Friday night, alongside fellow Alliance members Bounty Killer and Serani, Mavado shunned the after party scene for more important business.....a studio session with multi-platinum superstar Alicia Keys. "Last year we left the Reggae Tip show and recorded a track with Lil Kim and Wyclef, this year it was straight into the studio with Alicia Keys," said the Gully God. "I am very focussed on my career right now and I'm just trying to elevate myself and Jamaica on a whole through music. Working with Alicia is an honour and a pleasure." Its been a landmark year for Mavado, who has managed to balance an extensive international touring schedule, including the Caribbean, US, UK, Europe and Japan, with continuing to be one of the hottest acts in Jamaica. The collaboration is a Reggae track and should hit the airwaves very soon to create the buzz for Alicia Key's impending album. "My management and hers got together to make it happen and there was a great chemistry in the studio," continued Mavado. "Its the first time I've sung on a Studio One riddim and I'm very pleased with the outcome. Alicia loved it too and I'm sure we will be working together on projects in the future." The track was laid down at Alicia's own state-of-the-art The Oven Studio in New York.